What is IT Cost Reduction? IT Cost Reduction is the process of aligning the one-off and annual costs of your applications and IT infrastructure asset to a justified level because of the strategy and policies of the organization. In order to be able to reduce IT Costs, you must be able to see where the cost-saving opportunities are. How Does Dragon1 Support IT Cost Reduction? Dragon1 supports you in IT Cost reduction by helping you to create visualizations that show the costs made by the organization and where cost-saving opportunities are and in order to be able to do that, visualizing the benchmark cost, historical costs, future costs and hidden costs. In all these areas you can create diagrams and views on the Dragon1 platform that show the current and future state how you could and should migrate. For instance, switch over to cheaper cloud providers, or starting using IT assets much more efficient, instead keep buying new IT assets every month, and starting bargaining better with vendors and buy only what you really need or pat only for what you really use. These areas make the IT landscape much more complex and also makes it for people more difficult for IT professionals to do their job. Therefor Dragon1 helps you to visualize the complexity in these five areas and how to reduce it. For instance, by means of standardization and with that lowering costs. 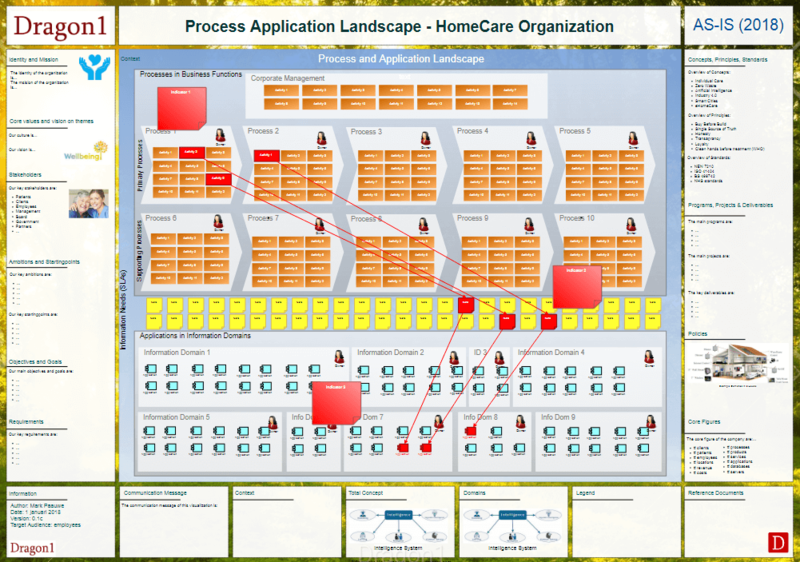 Often people create a process-application Landscape that shows exactly which applications are really necessary and which and applications could also be missed, or which applications are not used correctly or resued full enough. Such a visualization helps to identify all kinds of IT cost-saving opportunities. In organizations many things happen where not everyone is constantly busy with thinking: how necessary is this what we do in relation to the strategy? When working with EA, every project that is not related to or necessary because of strategy, get the advice to be stopped. If you create a diagram that shows the relationship of objectives, goals and IT assets and projects, you can often save IT Cost s and even prevent IT Costs (by stopping or redirecting projects). Also, every process, service, systems or construction that is not adding value to the business model or strategy, is advised to be stopped. This reduces complexity significantly and with that increases stability and overall quality. This too can be visualized by you: What is the complexity in the business processes and IT systems, and what IT costs can be saved when we reduce this complexity? Rationalizing every solution, based on benchmarks, standards, experience and reference will reduce costs. For this, you create on the Dragon1 platform a rationalization view. Having more overviews and insights in dependencies and interrelationship make sure you will reduce costs. Example Process Application Landscape that helps to identify IT cost-saving opportunities in terms of reusing applications more, deduplicating features, standardizing and reducing complexity. We have provided use cases for you that focus on saving IT cost and lowering IT complexity.